There is no Republican up for reelection this year who more richly deserves to lose than Lindsey Graham and it’s looking more likely that will happen by the day. 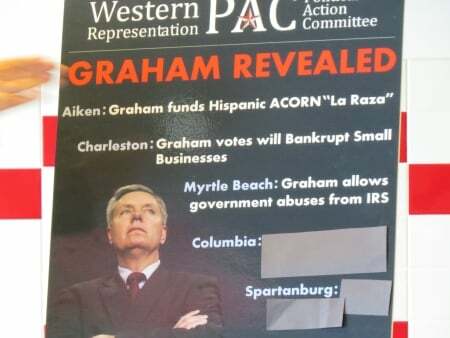 A new Clemson University poll shows U.S. Sen. Lindsey Graham is having trouble with his Republican base here at home. Clemson political science professor Dave Woodard conducted the poll last week and found only 31 percent of South Carolina’s Republicans plan to vote to re-elect Graham, regardless of who else was in the race. “This is the lowest ‘re-elect regardless’ figure I have seen for any incumbent in 20-odd years of polling except for one other lower figure,” he said, adding that timing might have played a role. The poll was taken one week after Graham and U.S. Sen. John McCain strongly supported a United States missile attack in Syria – a decision that 84 percent of the GOP base disagreed with, Woodard said. All three candidates running against Graham in the primary — Nancy Mace, Lee Bright and Richard Cash — would make better senators than Lindsey Graham. In a perfect scenario, two of those challengers would end up duking it out in a run-off after Graham is knocked out of the running. More realistically, we’ll probably end up with Graham going toe-to-toe with the most popular challenger in the run-off. Whoever that person is should have the support of every Republican in South Carolina. If Lindsey Graham wants to keep selling out conservatives, let him do it as a host on MSNBC instead of : from the floor of the Senate.